The all-new 2015 Mercedes-Benz GLA hasn’t even been officially unveiled and a new GLA45 AMG and A45 AMG Black Series were seen testing at Nurburgring. This is why we love Mercedes here at Torque News. Mercedes-AMG doesn’t waste any time turning a new vehicle into a high-power performance model. AMG GmgH is the high-performance division for Mercedes and they know how to customize any Mercedes vehicle and turn it into a performance enthusiasts dream. It looks like they are testing a new GLA45 AMG under cover at Nurburgring according to reports from AutoCar UK. A new A45 AMG Black Series prototype has also been seen at the “ring” which means more good things to come for the new compact hatch from Mercedes. A new Black Series model usually means it will be lighter, have special interior treatments with sport seats and custom exterior enhancements. Mercedes introduced the A-Class and GLA-Class for a new generation of customers and the new AMG variants will appeal to those looking for the ultimate performance from the premium compact class from Mercedes. The new GLA-Class will be a formidable performance vehicle with its turbocharged 2.0-liter engine, and AMG will lower the already quick 0-60 mph sprint times of 6.4 seconds. Look for 0-60 times in the sub 5.0 range. AutoCar is reporting the new GLA45 AMG will get the same powerplant as the A45 AMG with its 360 hp and 295 lb ft of torque which is a significant bump from the standard 208 hp and 258 lb ft of torque. 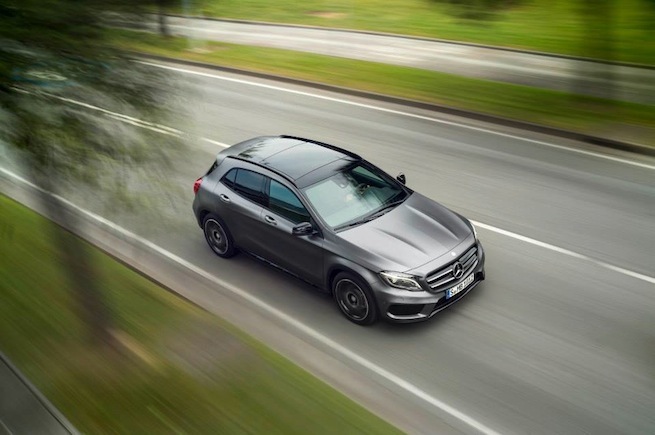 This will give the GLA SUV the type of performance deserving of the AMG badge. Mercedes-AMG will likely also tune the suspension with bigger brakes, stiffer suspension and lower ride height for better performance in the corners at high speeds. Mercedes is also been seen testing a Black Series version of the A45 AMG at Nurburgring in Germany. It is marked out by slightly wider wheel arches on a prototype that “otherwise looks close to the ‘standard’ AMG version” according to reports. A new A45 AMG Black Series will take the A-Class range to another level altogether. The compact performance car will already sprint from 0-100 km/h sprint in just 4.6 seconds and has a top speed of 250 km/h (electronically limited). It comes fitted standard with a performance-tuned AMG 4MATIC all-wheel drive system that transfers power to all four wheels for optimum traction in wet or dry conditions. Stay tuned to Torque News for the latest updates on the new 2015 GLA45 AMG and A45 AMG Black Series.